The choir consists of all types, from professionally-trained singers to people who can't read music (you do need to be able to match pitch). If you have a passion for helping others worship God through music, and if you are willing to work and play and grow, the choir is for you. The choir helps the congregation sing with feeling, energy, and fervor. Songs are selected with regard to the season of the church year and the biblical readings at each week. The choir sings at the 10:00 am service on Sundays with a brief warm up beforehand, and on specific holy days. Rehearsals are Wednesday evenings 7:00–9:00pm in the church. For information regarding this choir, please select the Adult Choir box on the "I want to learn more" page or email of our music leader. The main job of the Altar Guild is to prepare the church for worship services, by to taking care of the vessels, linens, candles, and other appointments that are used in these services. We are team oriented here at Ascension. We have five rotating teams, each on duty once every five weeks. Most teams meet on Saturday in order to set up for Sunday services, which takes about an hour, and the same team cleans up after the Sunday services. This includes breaking down the altar flowers into smaller arrangements as requested, for parishioners to take to the ill or home bound. Each team is on duty for the whole week, so any extra services during the week, are the responsibility of the team on duty. Twice a year everyone is invited to help; when we decorate the church for Christmas, and just before Palm Sunday, to make palm crosses. This is a joyful and rewarding ministry, and we would love to have some new members! For more information regarding this ministry, please select the Altar Guild Ministry box on the "I want to learn more" page. 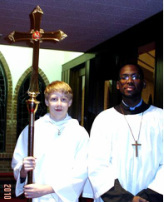 An Acolyte is an assistant to the priest in worship. Examples of acolyting can be found in the Old Testament and the practice was adopted by early Christians to add to the dignity of the worship service. Acolytes are needed at most church celebrations. Members of this ministry are 3rd grade and older, who attend faithfully. They show thoughtful commitment to service of the Lord through attentiveness and cooperation and are interested in the order of service. Acolyte training is provided as needed and Pastor Todd is always willing to provide instruction as required by the order of service. Click HERE for a description of an Acolytes duties. This will take you to the short version, which is a nice refresher. If you are a new acolyte please read through the longer explanation HERE. An Acolyte should know what their actions mean, not just go through the motions. For information on how to become an acolyte or to participate in acolyte training, please select the Acolyte box on the "I want to learn more" page. Lay Readers/Chalice Bearers are individuals licensed by the Bishop at the request of the Rector to read during Worship services. The Lector reads the Old and New Testament scriptures and the Intercessor reads the Prayers of the People, which follow the congregational recitation of the Nicene Creed. These men and women also assist the Clergy in the administration of Holy Communion by carrying the chalice. In addition, at the 8 am service they serve as acolytes, by bearing the cross as they process in, helping to set the table, and processing out of the church at the end of the service. Pam Schwabrow takes care to schedule this ministry on a rotating basis, and is always looking for new individuals who would like to serve. This is a great way to get involved on Sunday morning. 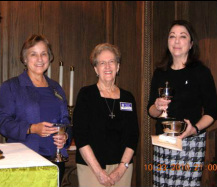 For more information on becoming a Lay Reader or Chalice Bearer, please select the Lay Readers/ Cup Bearers box on the "I want to learn more" page. The Sound System ministry is vital to Sunday Worship. This ministry, headed by Kathleen Hannah, consists of volunteers who operate and maintain the sound system in the sanctuary during worship services. This involves anything, from the pastor’s microphone and sermon recording to the battery replacement for the listening devices that enable the hearing impaired to hear. If you have a mild understanding of electronics and learn quickly, this is for you!! For information, please select the Sound System box on the "I want to learn more" page. Performing as Junior Acolyte is a great stepping stone for children, between Kindergarten and second grade who wish to become acolytes. They assist the pastor with the entrance procession, and help during the gospel, as well as participate with all the children in the congregation at the dismissal. For information regarding the duties of a Jr. Acolyte or to get your children involved, please select the Jr. Acolytes box on the "I want to learn more" page. The Lay Eucharistic Visitors are licensed individuals who bring Communion to any person who is unable to attend church services, because they are in the hospital stay, are ill, or homebound. Each Sunday a prayer is said for the LEV of the week, to bless them in the administration of their duties. This ministry is two-fold. You may contact Wendy Willeford if you are willing to receive the training and take communion to those who have requested it. Likewise, if you know of someone who is unable to attend service, please let the members of this ministry know, or encourage them to contact us so we may bring them this blessing. For more information about the duties of, or if you would like to become an, please select the LEV box on the "I want to learn more" page. Ushers are a vital part of the worship experience of all (Newcomers and life-long Ascensionites alike). The ushers are among the first church members to greet worshipers as they enter the church. Take a look at our the description of ministry duties. They are also among the first people called upon to help if worshipers have questions or if problems arise during the service (such as when someone needs direction to a rest room or when a medical emergency arises). It's the usher's job to be pleasant, patient and helpful at all times. We are the face of Christ for those walking through the doors of Ascension. For more information, please select the Ushers box on the "I want to learn more" page and please specify in the comments box which service (8am or 10:00am) you would like to volunteer for. The Prayer Team provides a place for individual prayer requests during communion at the 10:00am service. There are teams of two to the left of the sanctuary by the Daughters cross. We pray for family situations, healing, travel requests, comfort and for other reasons. Your prayers are always kept confidential. If you'd like to join the prayer team contact Michelle Feagin.